Did you know that there as many careers in the maritime economic sector of South Africa’s economy as there are fish in the in sea? 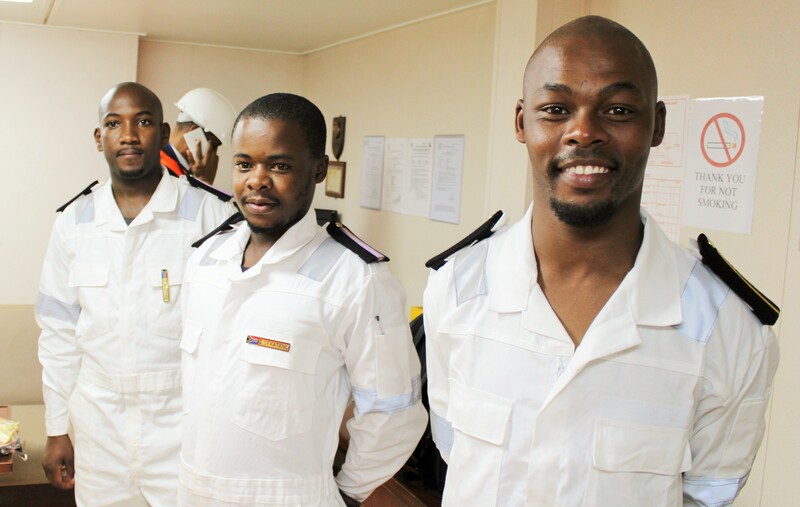 Three South African youths who recently boarded the country’s first registered vessel to carry the SA flag, the Cape Orchid and who will remain with it for hands-on sea-based training for six months beginning October 2015, are (from Left) Samkelo Ndongeni (25) a deck cadet from Ngqushwa near King Williams Town, Eastern Cape; Gordon Sekatang (26), an engine cadet from Nelspruit in Mpumalanga and Thembani Mazingi (24) also an engine cadet from Cofimvaba, Eastern Cape. They all are hoping to marine engineers at some point in the next 10 years. Marine engineering is but one of hundreds of careers one can pick on in the maritime economic sector. All right, perhaps not! But it is absolutely true that if you are interested in the maritime sector and are quite keen to give it a shot, you can actually choose from as many as 341 careers. South Africa’s Maritime Sector – In Brief. South Africa has approximately a 3000 km coastline running along the Atlantic Ocean, the Southern Seas and Indian Ocean, and because of it the country is anchored on one of the world’s important sea trade routes. It is the 28st largest economy in the globe with rich deposits of minerals, exporting over 125 million tons of cargo, agricultural produce and a strong tradition in maritime trade. The South African oceans offer extractive economic opportunities in mining, offshore oil and gas, fishing and aquaculture as well as non-extractive economic opportunities in areas such as marine tourism and leisure, marine manufacturing, transportation and other related activities. These economic activities are core industries that make up the maritime sector and key focus areas towards developing the maritime sector.